From 11 November 1975 (when, post-dismissal, he replaced Gough Whitlam, as a caretaker PM) until electoral defeat on 5 March 1983, Malcolm Fraser was known as a ruthless, inherently conservative political animal who, nonetheless, was that rarest of Australian scarcities: a genuine small-l liberal. Having quit his own party in protest in 2009, the soon-to-be-84-year-old Fraser has long been one of the nation's most prominent human rights champions. Now, aided by researcher/contributor, PhD candidate Cain Roberts, Fraser delivers a tour de force overview of Australia's troubled pursuit of security in the bosom of Great (Super) Powers. This elder statesman is quite the angry young man in print. Fraser delights in telegraphing his haymakers and following through with a well-placed elbow or two. The loosely-affiliated British colonies, he says, federated into the nation of Australia not to gain independence from the UK but to ensure Big Mumma would smack down any French, German or Japanese interloper looking to settle in PNG, the New Hebrides or Fiji. Australia's job was to carry out British foreign policy, so we legislated inequity through the White Australia Policy; and our treatment of Aboriginal Australians and asylum seekers has a glaring common denominator: racial prejudice. The whacks keep on coming: Australia's 'naïve faith in the wisdom and righteousness of the United Kingdom' was jettisoned after Singapore fell. Faced with Japan's space invaders, we wrapped ourselves around the Yanks' Star Spangled Suspenders. Dominoes falling, the Cold War froze any independent thought; but we fearfully outstayed our sensible sojourn on Uncle Sam's hind teat. Put bluntly, Fraser suggests we need to shed our lackey status. Australia should close down the US' Pine Gap Joint Defence Facility and seek a dignified distance, engaging maturely with conflicting powers such as the US, Japan and China. Having amply demonstrated that Australia has never consistently sought or possessed strategic independence, Fraser declares in measured terms that it's about time Australia advanced fairly and squarely on her own. 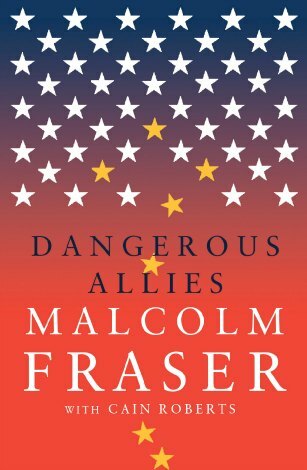 As former foreign minister Gareth Evans writes in the introduction to Dangerous Allies, 'there was no greater advocate than Malcolm Fraser during the Cold War years for the rewards of Australia's alliance with the US'. Today it's a very different world. And, as you remind us, Barry, it's also a very different man writing this book. Our 22nd prime minister and one-time advocate of an US-Australia alliance — or ANZUS — changed his stance after the end of the Cold War. As he saw it, this conflict had not only tilted world politics on its axis, but it ushered in the growth of 'American exceptionalism'. For Fraser this wasn't only a change of heart; it was to be his road-to-Damascus moment — and he has followed this new direction with all the passion, zeal and commitment befitting St Paul. To understand just how far Fraser has come, we need to travel back through Australian politics. From our early colonial foundation of 'strategic dependence' to the 'consolidation' of that position during the leadership of John Curtin ('I make it quite clear that Australia looks to America') this co-dependency was, as Fraser writes, 'in many ways a necessary evil'. Haunting the Australian consciousness at the time was the 'aggressive, dangerous and monolithic' spectre of Communism. So spooked were we Australians that even the Labor Party was viewed with suspicion. (Fraser diplomatically points that while communist parties used often brutal means to achieve their aims, socialists such as the Labor Party were 'firmly committed to democracy'). As Fraser writes, he, too, did his bit to foster this fear. It was 'in the environment of the time' and 'the knowledge' he had then that he 'fully supported the commitment in Vietnam'. A decision he now rues. Bitterly. As he writes, the Vietnam War 'is a case study of the perils of blind strategic dependence'. Dangerous Allies poses far from a perfect argument, but it lays down more than adequate ground for debate. Life after politics has allowed our self-confessed 'flawed' former PM time for self-reflection and righting a few wrongs. And if this book is anything to go by, then we are all better for it. The one thing that Australia cannot deliver for itself is security of its shipping trade routes. This is the one thing of value that these alliances delivered. That said, I do believe that Australia should gently distance itself from the USA. It should not have gone to Iraq, and probably not to Afghanistan. Vietnam, too, I guess, but that is so long ago and the dominoes were arranged differently. Fraser is only partially correct in his perception. The world has moved on since the end of the Cold War and there are issues, intelligence, engagements and relationships that Fraser is not privy to - the dynamics of strategic relationships have changed in the world. Fraser belongs in the past but he is right in that Australia needs to mature and stop looking to the US and Europe for identity and in some ways security. We are part of Asia/Pacific region and despite being (in a majority) white Anglo-Saxon we need to recognise where this nation sits. In many ways our relationship with China and Japan are more important than with the US. Perhaps the word "lackey" is too strong - we do need a relationship with the US too but it would be interesting to assess what the balance actually is. It must be remembered our Defence is not limited just to the ADF but also strategic relationships. If Fraser is suggesting we burn one of the most important strategic relationships, then he really does belong in the past. Muffled exclamations send Italian syllables into the far pale blue... the small cannon balls bounce across the peaceful green... the men huddle convene for a verdict. Given last week's unequivocal iteration of the dire state of Australian politics, perhaps we've earned the right to a bit of escapism. The Secret Life of Walter Mitty proves adept at turning the warm-and-fuzzies up to 11. Still there's no escaping the sense that Walter's ability to jet around the world in order to find himself is implicitly an expression of affluent, white male privilege.